ForgeFX Simulations is honored to be a simulation development partner for Pierce Manufacturing, one of the largest fire apparatus producers in the world. 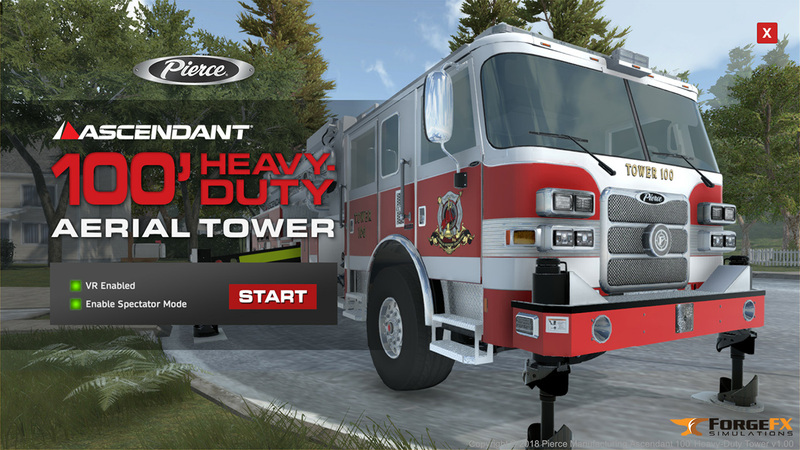 ForgeFX worked with Pierce to develop the Pierce Ascendant® 100 Heavy Duty Aerial Tower Fire Truck Simulator. Pierce is an Appleton, Wisconsin-based manufacturer of custom fire and rescue apparatus and a wholly owned subsidiary of Oshkosh Corporation. Oshkosh is a leading manufacturer and marketer of access equipment, specialty vehicles and truck bodies for the primary markets of defense, concrete placement, refuse hauling, access equipment and fire & emergency. ForgeFX is proud to be a simulation development partner with Oshkosh for more than 5 years, currently supporting their Pierce Manufacturing and JLG Industry brands, by providing simulation development services for a wide array of equipment and trucks across industry sectors. ForgeFX Simulations worked closely with Pierce Manufacturing to develop a virtual reality (VR) based simulator for their Ascendant 100′ Heavy Duty Aerial Tower. The simulator helps Pierce’s customers experience the truck’s superior maneuverability, drivability, and operator functionality—without ever stepping foot into a physical truck. Connected to the truck’s real physical controls, the simulation software immerses users in an interactive virtual environment where they are operating an Ascendant 100′ Heavy Duty Aerial Tower in virtual reality. 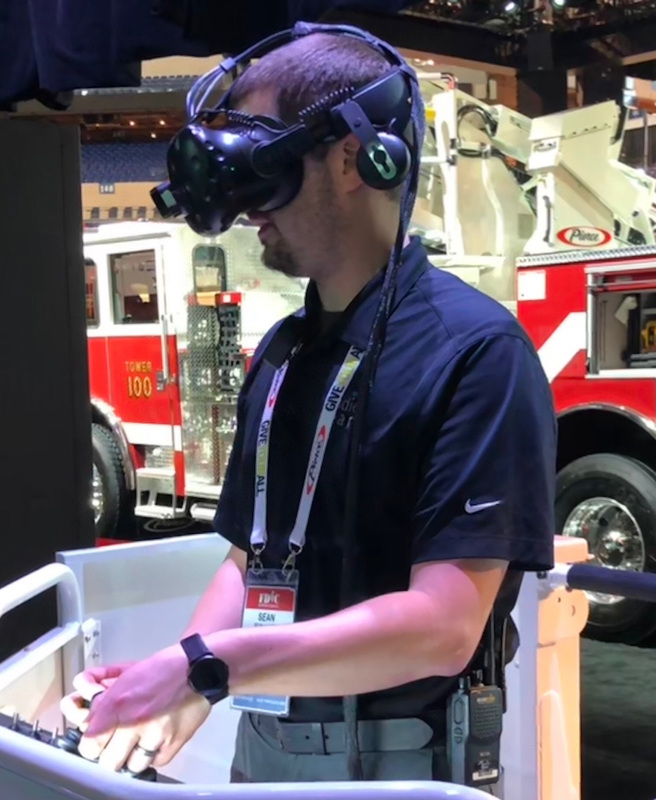 In conjunction with the release of the Ascendant 100′ Heavy Duty Aerial Tower at the Fire Department Instructors Conference (FDIC) Exhibition on April 26 – 28, 2018 in Indianapolis, Indiana, Pierce Manufacturing featured their latest innovations and apparatus, including this VR-based Fire Truck Simulator. 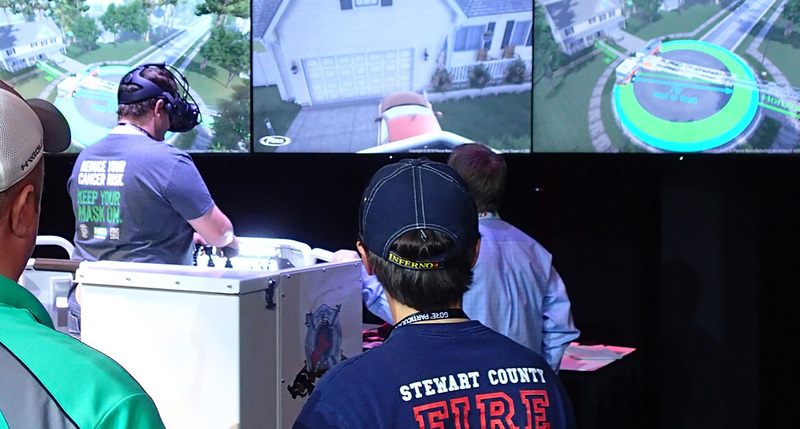 The simulator was available to all conference and exhibition attendees, allowing them to climb aboard and take the controls of an Ascendant 100′ Heavy Duty Aerial Tower, in virtual reality. FDIC is a great place to see and touch fire and rescue apparatus, but allowing attendees to operate the truck is not something that’s often possible. The simulator helps Pierce overcome this hurdle and gives them the ability to allow people to not only see and touch the real truck, but to also operate a virtual version of it, which mirrors the real truck directly. The simulator includes multiple scenarios for users to tackle, including completing tasks in challenging environments, like tight streets or below-grade rescues. Driven by the truck’s real-world controls, operators are able to test-drive the aerial and get a feel of the actual platform control console. Connecting real-world machine controls to the virtual simulator software provides an invaluable experience to operators, giving them untethered access to trucks that are expensive, potentially dangerous, and often in use and not available. Placing the user at the controls in the aerial platform fire truck simulator, operators are able master the platform control console and be able to test and appreciate the membrane function panel. Users are able to experience the easy maneuverability and positioning of the fire truck, as well as the fire suppression system and single rear axle stabilizers. 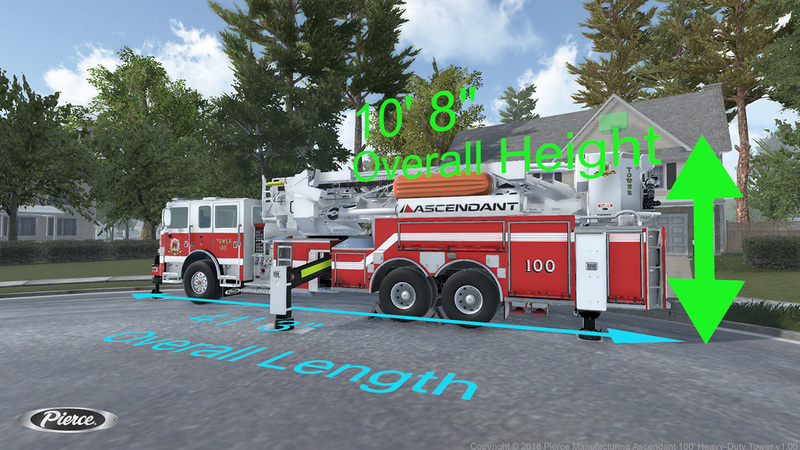 This VR-based simulator, which includes head tracking, body position tracking, and hand tracking, allows users to become fully immersed in the spatial awareness challenges they’ll face in the real-world, and how the Pierce Ascendant 100′ Heavy Duty Aerial Tower will help them overcome these challenges. 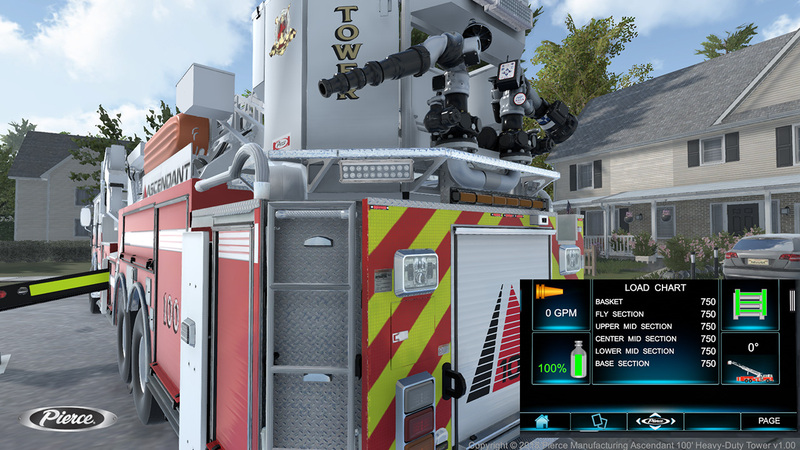 The Pierce Ascendant fire truck simulator includes a heads-up-display that provides users with a visualization of many important truck specifications. Operators are able to quickly see, experience, and understand the specific advantages that the truck offers, like overall length and horizontal and vertical reach. The Ascendant is designed to be operated on either an uphill or downhill slope while meeting all NFPA stability requirements. The simulator helps operators experience the capabilities of the truck in a variety of different locations so they can virtually practice for situations where they can take advantage of the the truck’s abilities. Reaching heights of 100′ vertically and 93′ horizontally, the Ascendant 100′ Aerial Tower packages a 5-section heavy-duty steel tower onto a vehicle with a low overall height of 10’8″ and length of only 41’3” with a rear overhang of a rear-mount that minimizes tail-swing, it offers superior maneuverability and greater visibility. With the turntable positioned higher behind the cab, it increases visibility down the entire ladder while stowed and deployed, something that’s easy to explain but difficult to experience. The simulator allows operators to jump right into a virtual truck, put it through the paces, and immediately see this benefit for themselves, in virtual reality. Designed using 100K psi high-strength steel, the 4-person, 1,000 lb dry tip load, ergonomic basket has chamfered front corners, dual monitors, and is easily accessible from the ground. Complete with a virtual fluid dynamics system, the simulator allows operators to jump into the basket, take the controls, and have full control over the virtual aerial tower, giving them the ability to experience first-hand the industry-leading capabilities of the Pierce 100′ Ascendant Heavy Duty Aerial Tower. The dual monitors are capable of flowing water at the rate of up to 2,000 gallons-per-minute. 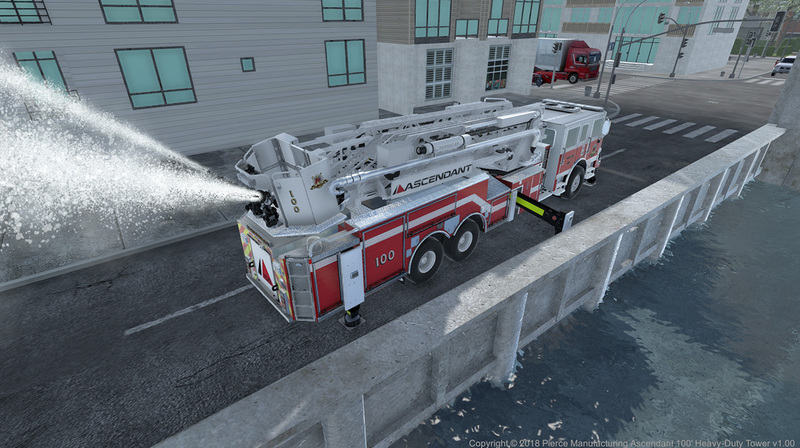 Users of this fire truck simulator are able to take control of the monitors and have unlimited horizontal nozzle sweep and vertical nozzle sweep of 45° above horizontal, so they can experience the advantages of the Pierce 100′ Ascendant Heavy Duty Aerial Tower monitor control system for themselves, in virtual reality. Pierce Manufacturing Inc., an Oshkosh Corporation [NYSE: OSK] company, is a leading North American manufacturer of custom fire apparatus, including custom and commercial pumpers, aerials, rescue trucks, wildland trucks, minipumpers, elliptical tankers, and homeland security apparatus. Founded in 1917, Oshkosh Corporation [NYSE: OSK] is a leader in designing, manufacturing and servicing a broad range of access equipment, commercial, fire & emergency, military and specialty vehicles and vehicle bodies under the brands of Oshkosh®, JLG®, Pierce®, McNeilus®, Jerr-Dan®, Frontline™, CON-E-CO®, London® and IMT®. Oshkosh is a Fortune 500 Company with manufacturing operations on four continents. Its products are recognized around the world for quality, durability and innovation, and can be found in more than 150 countries around the globe. Whether you are interested in learning more about Pierce Manufacturing's 100' Ascendant Heavy Duty Aerial Tower or looking for a software vendor to develop a custom simulation for your organization, contact us now to learn more about how we can be of service to you.